I came to Alaska on Vacation for a week in the late 1980’s, and loved it so much that I moved myself to Alaska when I was around 21. I took a job at a local tackle shop, where I figured out I wanted to start guiding. I became one of the early Alaska fishing guides on the Kenai River while guiding during the mornings and working at the tackle shop afternoons and evenings. While there I had the opportunity to guide the guys from Berkley Fishing, and since then I have sworn by my Berkley Fishing rods. After taking Mike and his buddy in the ugliest 17 foot drift boat on the Kenai, I was shocked when Mike asked me if I was interested in becoming an ambassador. That was the helping hand I needed for my business, since I couldn’t afford nice fishing gear at that time. It had only been three months since the birth of my son. Since 1995 we’ve had great sponsors for our Alaska fishing guides, and I owe a big thank you to all the great guys from Pure Fishing that I’ve had the pleasure to meet and work with over the years. There is nothing better than to be able to have our guests use the best equipment. To keep up on the gear that we are using, go to our fishing tackle page. Now, I’m over 50 years old and my fishing goal is giving back to the fishing industry that has allowed me do what I have loved to do. Our goal is to show all our guests the best vacation, while getting to use all the best equipment. 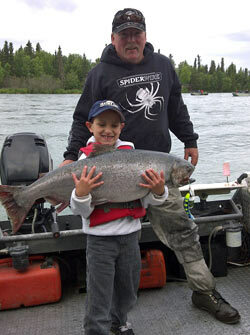 Growing up I was always around other Alaska fishing guides since dad has been a fishing guide for my whole life. I remember going out with him and fishing for kings ’cause it was my favorite alongside the humpies. I’ve caught quite a few big fish, but the biggest were a 74 lb king and an 80 lb king salmon, which I released for the Release A Hog program. Once I got a little older, around 13, I decided to help out my dad in our processing room that we have had for a couple years. I took the Coast Guard test to get my guiding license, but decided that I really didn’t want to guide. Then I ran the processing room by myself until a few years ago when me and my dad started our Alaska Gold Prospecting business. I’ve done gold prospecting since I was 8 years old, and ever since then I’ve been hooked. I thoroughly enjoy finding gold in places that nobody else has looked, or have just missed. Teaching others how to look for gold, whether it be in the creek or on land, is what I enjoy. Then they can go back home and do it for themselves. It gives a good feeling of accomplishment to teach others the tricks of the trade. I was born into a globe trotting Air Force family. My father retired in 1957. We moved to Alaska in ’58, and homesteaded in ’59 100 miles north of Anchorage by road. The 160 acre homestead was separated in about two equal sections by the river running diagonally through the property. We grew up fishing for 4 species of Pacific Salmon in the stream, along with Rainbow Trout (my favorite), Dolly Varden, and Grayling. It is as if fishing is in my blood. I have owned, or had access to, a boat since I was in high school. We mostly water skied in the boat I had in collage, but a few fish were boated as well! A job change occurred in 1983, thus my wife, Debby, our two children, and myself uprooted and moved to Alaska. I was happy to be home and began to seriously make up for any lost fishing time. Between weekends, vacations, and a job that took me all over the mainland parts of Alaska, I have been privileged to fish every major water drainage in the bulk of Alaska. 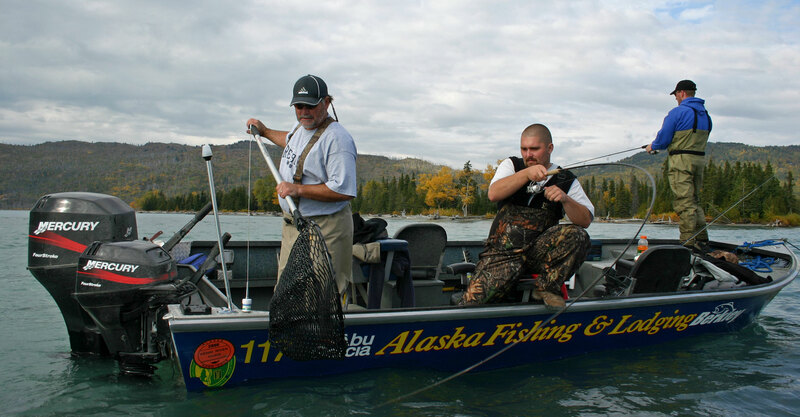 As one of the main Alaska fishing guides at Alaska Fishing and Lodging, I feel I have lots to offer to those who want to fish the Kenai River. Fishing for King Salmon is a thrill when the rod buries down nearly to the water and the level wind reel starts “screaming” as the line rolls off the spool. Before the end of King fishing, the Reds start running. The reds are the best eating and can be easily caught when they are running. We end our summer fishing for Coho (Silver Salmon) and Rainbow Trout. This will be my 10th year as a professional fishing guide. Being on the river is a great experience that I enjoy sharing with our guests. The summer gets filled up with fishing rod building, fly tying, and lots of river fishing. In my spare time I get to fish with my wife Debby. She took to fishing like a duck takes to water. I love what I do and have shared the river experience with many. 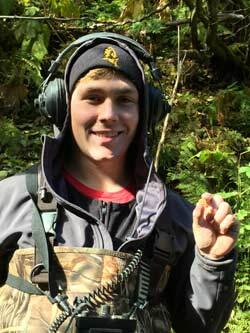 Michael Patterson is a 4th generation Alaskan and has been an avid fisherman all of his life. Michael’s family moved to Alaska during the 1800’s gold rush and settled in Fairbanks, Alaska. They later relocated to Alaska’s largest city, Anchorage, where they have lived ever since. 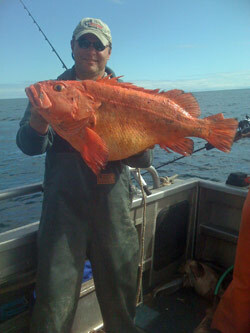 Michael’s family began commercial and sport fishing the Cook Inlet basin in 1910. For generations they have passed down the local knowledge and expertise gained from literally thousands of fishing days focused on these local waters. This passion was definitely passed down to Michael. His love of fishing started out at the age of 3 when his father George helped him land his first salmon, which turned out to be a 30 lb king. From there he spent all of his young life trekking and fishing Alaska every day and everywhere he could. 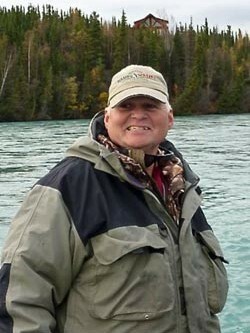 In 1993 Michael joined the ranks of Alaska halibut fishing guides and started guiding halibut and salmon fisherman. Operating an Alaska fishing charter turned out to be a perfect way for him share his love for Alaska fishing with hundreds of guests each summer. For the past 21 years “Capt Mike” has been earned a reputation as one of the premier Alaska fishing Guides and is a full time Alaska fishing charter boat captain. He has achieved a 100 Ton Masters License from the United States Coast Guard.